When the Combine appears at your window you know that Summer is wrapping up its might, the heat has relaxed and the soft winds of September are on their way. It seems that if i sit still long enough i start to blister from the aperture of doing little. I should be relaxing, and in a way it think i might be, but there is so much to think about and plan. Not like in the old days, things happened and when they did it was wonderful, these days you have to work hard and hope, dream and push the elephant up the hill. After a week in Edinburgh i feel very inspired, to do more, more like this. My show went so well i was shocked, 7 sold out afternoons with standing ovations and haze. I think im repeating myself here, thats how it feels most days. We were on after the Korean Tango band, an odd mixture of traditional and not so, they played to various houses, some slim. My show was one hour in length and seemed to fly by, sandwiched between lunch and diner. I like the 3.30pm shows i have to say. Our digs were in a new block of student flats, there were many doors in the hallway and it felt like being in an advent calendar. Boo and i made home of the not very much, there was a fridge by way of atmosphere, in my room i had black sheets, not a pretty sight by the end of the week. I hated sleeping there in that darkness. As in my previous blog it was a learning curve. We all need them. Edinburgh buzzes like no other city there are so many people milling and selling, flying and pushing shows, so many shows. I wish i had seen more, but i felt so tired all of the time, the set took it out of me. I felt slippered. The drive home was long and tired me out too, so a week later and I’m still trying to come to terms with myself. I really enjoyed the experience of being at the festival and being part of the fridge, and fringe. I want to write more. I want to write more. Bring back the early 70’s when life seemed to stagger along from one day to the next. Race around Freddy, thats me. Back home and a trip to the theatre in London with Mrs, we saw the wonderful Fun Home at the Young Vic, its moving into the West End soon and when it does you should try and see it. I loved the writing, it moved me, musicals seem to. I felt engrossed in the story the melody and the lyric, its a web of emotional feelings that i often can’t seem to deal with. I want one. Who knows, next year? I always seem to get a lump in my throat where seeing musicals, it must touch something deep inside. Most days I oscillate between this that and the other, I’m not one thing or another, i feel like i have been standing on a rock covered in seaweed, I’m finely balanced and I’m trying hard not to fall. I feel like i have never worked so hard as i do now, to stand still i have to make like a swan yet beneath the waterline its all go. There is little certainty to life, there are lines of certainty for sure but in general its a bit upside down. I cant seem to pin anything i want to do to any mast, its like the ship has left port and I’m not on it. When i do a gratitude list i feel much better, in my head the dream goes on forever but in reality it never does. There is something significant about the Combine outside, its churning and sorting, the wheat from the chaff, the lines of certainty it provides and its arm of delivery. I looked at my feeds online, people in Italy by the sea, people in the South of France, sunshine, holidays and beers, food wine and sunlight. Happy days. Everyone is busy, life seems full, but why cant there be still, gentle and harmony in words deeds and in the day. One day perhaps this will all seem like it means something to someone. I think about the farmer in his tractor, there he waits for the returning hooper full of harvest. To me, to you. The Combine is quite now. Farmer walks backwards down its steep steps from the cabin, the sun is setting fast and its time for his tea, and mine too. 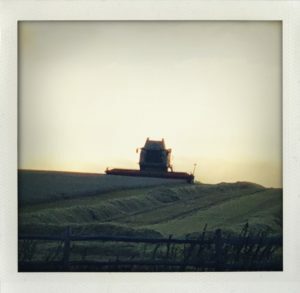 The Combine sits outside my window lurking on the other side of the wood, its time to sleep now and cool those jets, rest those blades and fold up in the blue light of dusk as its seeps in from above. The clouds joined by grey light, the moon, almost new, sitting on top of us all like a chin. I can hear the relief of the driver as he hops back into his van, off home, another day. Me I’m just digging the words that flow from thin air. I have no real idea how this came to me, this life like a pancake constantly tossed in mid air, but here it is, its a life full of challenges, a life full of stories and dreams. Even though it seems like bedtime i feel like breakfast, i feel like being on a roll, a bacon roll, or being on a raft out at sea, floating up and down up and down with the waves, taking in the air, the air of salt. My dream its shattered by the reality that is darkness, the desk the light and the revolving lazy Susan of words. Proud to be within. They say the final third is the most reflective of all the years in ones life, like the final furlong, looking back at the also rans, then over my shoulder the stands where the binoculars of the passers by look towards the winning post. I raise myself up in the saddle feeling the air push my face as i speed to the line, another line. The race is never over, until sleep. Sleep is like a pause in the proceedings, my eyes shut and then i wake to see its a new day and the race is back on, back in the dam saddle. The hum of childhood, it is so far behind me now i can only reinvent the parts of my life that seemed charmed, as most of my life has been. The horse sniffs and snorts at me, we stop in the paddock to hear the cheers, i look around for people that i know, but where have they gone. I may have succeeded in winning this race but in doing so have lost so many along the way, sadly. Sadness dawns on me as i leap to the ground, walking with the horse into the shadows of another long day. As one we enter the room, as one we except nothing less than glory and gratitude. The Combine, the shows, the darkness and the light, its all part of the same happiness stolen in brief moments of mood swing. For the most part its normal to feel the reigns in such a tight grip. In this final third the competition is strong and often fierce, mud, horses, hats in the air and the moon with its chin above me. And then just before bed, a review from the shows pops up on my screen, it seems like i painted myself as a failure in Edinburgh. Far from it, i think the show paints a picture of journey luck and love. Yes i don’t think i made it up the steps to the success of some of my contemporaries but i feel placed within the reality that God has given me. I made the mistakes i made along the way but in passing i think i am where im meant to be. Its a great review and it leaves me proud, now its time to write the next one and move on into a another day. Just around the corner though three Squeeze shows, back in the dressing room with the suited and booted. Deal, On Blackheath and something in the park. A food festival. Back to the set. I’m looking forward to the banter the playing and the songs that have been my life for so long, the ones that make me who I am. Not at all a failure but part of a great writing team who have created some of the best songs in modern English songwriting history. Its a fantastic band of people and our cannon is poised full of incredible songs. We balance one another out with the passing of years, and in doing so people come to see the show and love those songs, we are merely the milkman who deliver them. Our float has been out on the road now for over a year, its time to rest the gold tops for a few months while we reconsider how we stack the next few crates of words and melodies. Its still exciting not knowing where its all going, it rushes like Salmon over the rocks into the air, drops of sunlight and river everywhere. How lucky am i. Old Les was my milkman back in the childhood and i assisted him around the flats and houses of Blackheath, he would whistle all the while, a lovely feller with a broad smile. Generous to a T. His float was something i hopped on and off of each day early in the morning. 3 more shows to hop on and off of, three more shows to be within and explore all the wonder of the journey that has got me here today. Maybe a squeaky wheel sometimes but its the squeaky wheel that gets the oil.